British number one Johanna Konta has been awarded a 'lucky loser' spot for the main draw in Linz after defeat in qualifying for the WTA event. Konta, at a career-high ranking of 47, lost 6-2 2-6 6-4 to world number 105 Klara Koukalova in qualifying. But she will now play Germany's Annika Beck in the first round on Tuesday. The loss to Czech Koukalova was only Konta's third defeat in 26 matches since Wimbledon, and her first to a lower-ranked player since May. The 24-year-old will also play doubles with fellow Briton Naomi Broady in Linz, before heading to Luxembourg next week. 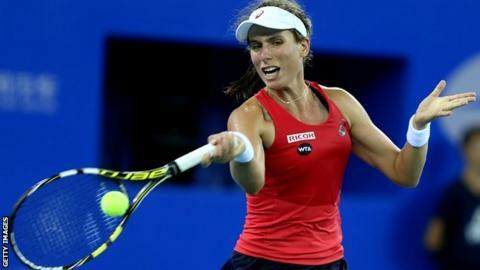 Konta had followed up her remarkable run to the quarter-finals in Wuhan, China, where she beat world number two Simona Halep before losing narrowly to Venus Williams, with two qualifying wins in Linz. Having broken into into the world's top 50 for the first time last week, those two wins helped her rise another two places to 47 on Monday. The Briton's last defeat by a lower-ranked player came in May against Maria-Teresa Torro-Flor, who was ranked 164th to Konta's 143rd. The Spaniard won 4-6 7-6 6-2 in Saint-Gaudens, France, on the second-tier ITF circuit. Konta's only other defeats since a first-round loss to Maria Sharapova at Wimbledon had come against Williams, and two-time Wimbledon champion Petra Kvitova at the US Open. Konta's fellow British number one, Andy Murray, will return to action this week for the first time since Britain's Davis Cup win over Australia last month. The Scot, 28, has a bye in round one of the Shanghai Masters and will play American Steve Johnson in round two. Should he win that, Murray could then face Belgian number one David Goffin, with the pair likely to lead their respective nations in the Davis Cup final next month. Novak Djokovic is the top seed in Shanghai and could meet Murray in the semi-finals, with Roger Federer, Stan Wawrinka and Rafael Nadal in the opposite half of the draw.